The transmission requirements for both Motorsport and Automotive vehicles are trending towards ever lighter and more efficient units as emission and fuel requirements are becoming increasingly stringent. Xtrac are at the forefront of these transmission developments and to ensure that we stay as market leaders we have exciting development plans for the organisation including significant capital and personnel expansions. Our Quality team have an opening for a Graduate Quality Engineer commencing in the summer of 2018. 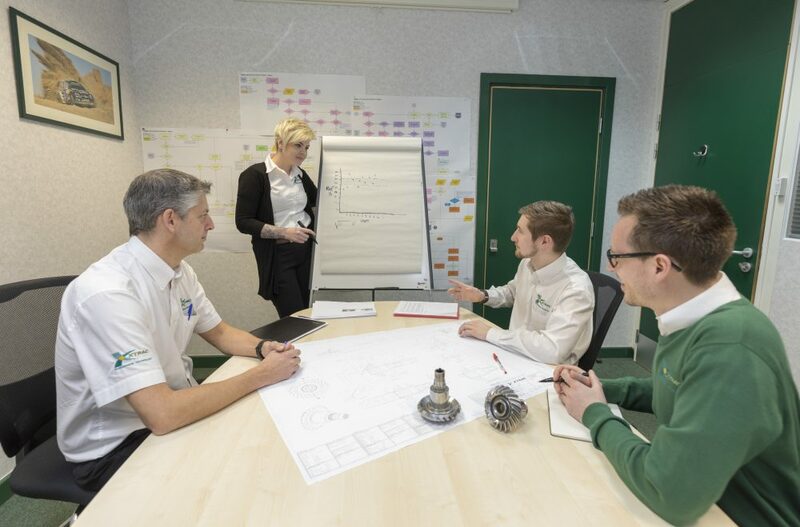 Working alongside current Quality Engineers Chris Marrs and Jo Smith you will be working closely with our Customers, Suppliers, Xtrac’s Engineers, Foremen and Machinists to assist with managing all quality related issues. Now in his 4th year at Xtrac, having completed his Advanced Apprenticeship, Chris has spent his time in the majority of the manufacturing departments and has chosen to specialise within the quality department and is now working as a Quality Engineer, a highly skilled role which delivers real value to the business. In addition to completing his apprenticeship, Chris is furthering his training and education with a degree apprenticeship due to complete in 2021. Chris and Jo with CNC Miller Jamie Day. Chris and Jo Discuss a Quality Process with Engineer Alex MacDonald.